1933 ad placed by Hugo Boss for Nazi uniforms, work, sports and rainwear. In 1923, Hugo Boss founded his own clothing company in Metzingen, Germany, where it is still based. In 1924, he started a factory along with two partners. The company produced shirts, jackets, work clothing, sportswear and raincoats. Due to the economic climate of Germany at the time, Boss was forced into bankruptcy. In 1931, he reached an agreement with his creditors, leaving him with six sewing machines to start again. 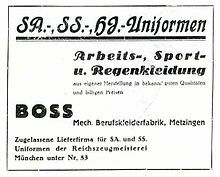 That same year, Hugo Boss became a member of the Nazi Party, receiving the membership number 508 889, and a sponsoring member ("Förderndes Mitglied") of the Schutzstaffel (SS). He also joined the German Labour Front in 1936, the Reich Air Protection Association in 1939, and the National Socialist People's Welfare in 1941. He was also a member of the Reichskriegerbund and the Reichsbund for physical exercises. After joining these organizations, his sales increased from 38,260 RM ($26,993 U.S. dollars in 1932) to over 3,300,000 RM in 1941. Though he claimed in a 1934–35 advertisement that he had been a "supplier for National Socialist uniforms since 1924", it is probable that he did not begin to supply them until 1928 at the earliest. This is the year he became a Reichszeugmeisterei-licensed supplier of uniforms to the Sturmabteilung (SA), Schutzstaffel, Hitler Youth, National Socialist Motor Corps, and other party organizations. By the third quarter of 1932, the all-black SS uniform was designed by SS members Karl Diebitsch (artist) and Walter Heck (graphic designer). The Hugo Boss company was one of the companies that produced these black uniforms for the SS. By 1938, the firm was focused on producing Wehrmacht uniforms and later also uniforms for the Waffen-SS. Heinrich Himmler in an SS uniform, of a type manufactured by Hugo Boss, visiting Dachau Concentration Camp. During the Second World War, Hugo Boss employed 140 forced labourers, the majority of them women. In addition to these workers, 40 French prisoners of war also worked for the company briefly between October 1940 - April 1941. According to German historian Henning Kober, the company managers were fervent National Socialists who were all great admirers of Adolf Hitler. In 1945, Hugo Boss had a photograph in his apartment of him with Hitler, taken at the Berghof, Hitler's Obersalzberg retreat. Because of his early NS Party membership, his financial support of the SS and the uniforms delivered to the National Socialist German Workers Party, Boss was considered both an "activist" and a "supporter and beneficiary of National Socialism". In a 1946 judgment, he was stripped of his voting rights, his capacity to run a business, and fined "a very heavy penalty" of 100,000 DM ($70,553 U.S. dollars)(£54,008.61). However, Boss appealed, and he was eventually classified as a ‘follower’, a lesser category, which meant that he was not regarded as an active promoter of National Socialism. He died in 1948, but his business survived. In 2011, the company issued a statement of "profound regret to those who suffered harm or hardship at the factory run by Hugo Boss under National Socialist rule". As a result of the ban on Boss being in business, his son-in-law Eugen Holy took over ownership and running of the company. In 1950, after a period supplying work uniforms, the company received its first order for men's suits, resulting in an expansion to 150 employees by the end of the year. By 1960, the company was producing ready made suits. In 1969, Eugen retired, leaving the company to his sons Jochen and Uwe, who began international development. In 1970, the first Boss branded suits were produced, with the brand becoming a registered trademark in 1977. This was followed by the start of the company's long association with motorsport, sponsoring Formula One driver Niki Lauda, and later the McLaren Racing team. After the Marzotto textile group acquired a 77.5% stake for $165,000,000 in 1991, the Hugo and Baldessarini brands were introduced in 1993. In 1995, the company launched its footwear range, the first in a now fully developed leather products range across all sub-brands. A partnership with the Solomon R. Guggenheim Foundation was launched in 1995, resulting in the Hugo Boss Prize, an annual $100,000 stipend in modern arts presented since 1996. In 2005, Marzotto spun off its fashion brands into the Valentino Fashion Group, which was then sold to Permira private equity group. In March 2015, Permira announced plans to sell the remaining shareholding of 12%. Since the exit by Permira, 91% of the shares floated on the Börse Frankfurt, and the residual 2% was held by the company. 7% of the shares are owned by the Marzotto family. Hugo Boss has at least 6,102 points of sale in 124 countries. Hugo Boss AG directly owns over 364 shops, 537 monobrand shops, and over 1,000 franchise-owned shops. In 2010, the company had sales of $2,345,850,000 and a net profit of $262,183,000, with royalties of 42% of total net profit. In June 2013, Jason Wu was named artistic director of Boss Womenswear. In 2017, the sales of Hugo Boss climbed by 7 percent during the final quarter of the year. In March 2010, Hugo Boss was boycotted by actor Danny Glover for the company's plans to close the plant in Brooklyn, Ohio, after 375 employees of the Workers United Union reportedly rejected the Hugo Boss proposal to cut the workers' hourly wage 36% from $13 an hour to $8.30. After an initial statement by CFO Andreas Stockert saying the company had a responsibility to shareholders and would move suit manufacturing from Ohio to other facilities in Turkey, Bulgaria, and Romania, the company capitulated to the boycott and cancelled the project. Renewed plans to close the plant in April 2015 also failed. In September 2015, Hugo Boss (UK) was fined £1.2m in relation to the death in June 2013 of a child who died four days after suffering fatal head injuries at its store in Bicester, Oxfordshire. The four-year-old boy had been injured when a steel-framed fitting-room mirror weighing 120 kg (250 lb) fell on him. Oxford Crown Court had earlier been told that it had "negligently been left free-standing without any fixings" and the coroner had said that the death was an "accident waiting to happen". In June 2015, Hugo Boss (UK) had admitted its breach of both the Health and Safety at Work Act 1974 and Management of Health and Safety at Work regulations 1999. The company’s legal representative said: "The consequence of this failing is as awful as one could reasonably imagine. Since the day of the accident Hugo Boss has done all it can, first to acknowledge those failings, to express genuine, heartfelt remorse and also demonstrate a determination to put things right and ensure there cannot be a repeat of what went wrong". Boss Bottled, a fragrance launched in 1998. Products are manufactured in a variety of locations, including the company's own production sites in: Metzingen, Germany; Morrovalle, Italy; Radom, Poland; Izmir, Turkey; and Cleveland, United States. Hugo Boss has invested in technology for its made-to-measure program, using machines for almost all the tailoring traditionally made by hand. Hugo Boss has licensing agreements with various companies to produce Hugo Boss branded products. These include agreements with Samsung, HTC and Huawei to produce mobile phones; Nike, Inc. to produce sports equipment; C.W.F. Children Worldwide Fashion SAS to produce children's clothing; Coty to produce fragrances and skincare; Movado to produce watches; and Safilo to produce sunglasses and eyewear. ^ a b c d e f "Hugo Boss Annual Report 2018" (PDF). ^ Landler, Mark (April 12, 2005). "A Small Town in Germany Fits Hugo Boss Nicely". The New York Times. p. C00001. ^ Roman, Köster (2011). Hugo Boss, 1924-1945: Die Geschichte einer Kleiderfabrik zwischen Weimarer Republik und "Drittem Reich" (in German). Germany: C.H. Beck. p. 31. ISBN 978-3406619922. ^ a b c d Timm, Elisabeth (April 12, 2018). "Hugo Ferdinand Boss (1885–1948) und die Firma Hugo Boss" (PDF). Metzingen Zwangsarbeit (in German). Retrieved April 12, 2018. ^ Obermaier, Frederik (September 23, 2011). "Hugo Boss in der NS-Zeit – Mode mit brauner Vergangenheit" (in German). Süddeutsche Zeitung. Retrieved April 12, 2018. ^ "Biografie Hugo Ferdinand Boss". Who's Who (in German). Retrieved April 12, 2018. ^ a b c Köster, Roman. "Hugo Boss, 1924-1945. A Clothing Factory During the Weimar Republic and Third Reich" (PDF). Hugoboss.com. ^ Kober, Henning (July 29, 2001). "Über den Umgang mit Zwangsarbeiterinnen bei Boss". Metzinger Zwangsarbeit (in German). Retrieved January 1, 2011. ^ a b c d e Chevalier, Michel (2012). Luxury Brand Management. Singapore: John Wiley & Sons. ISBN 978-1-118-17176-9. ^ "Marzotto S.p.A." The New York Times. November 2, 1991. Retrieved January 1, 2011. ^ "Results of Operations in Fiscal Year 2009". Hugo Boss AG. Archived from the original on September 2, 2010. Retrieved February 13, 2011. ^ "The Boss Is Back". Bloomberg.com. January 16, 2018. Retrieved January 25, 2018. ^ Glover, Danny (March 7, 2010). "Glover: Help Ohio Plant, Shun Hugo Boss At Oscars". Associated Press. Retrieved January 1, 2011. ^ Covert, James (April 24, 2010). "Stars' factory crusade shows Hugo who's 'Boss'". The New York Post. Retrieved January 1, 2011. ^ Perkins, Olivera (December 2, 2014). "Hugo Boss says it will close Cleveland area plant in 2015, but unions ready to fight it — again". The Plain Dealer. Retrieved December 9, 2014. ^ Perkins, Olivera (March 20, 2015). "Hugo Boss plant will stay open with new owners, saving 160+ jobs". The Plain Dealer. ^ a b "Hugo Boss fined £1.2m over Bicester Village mirror death". BBC News Online. September 4, 2015. Retrieved September 5, 2015. ^ "Bicester Hugo Boss store admits charges over boy's mirror death". BBC News Online. June 3, 2015. Retrieved September 5, 2015. ^ a b Press Association (September 3, 2015). "Hugo Boss faces huge fine over toddler's death in store". The Guardian. Retrieved September 5, 2015. ^ "Boss Bottled (1998)". Basenotes. Retrieved January 7, 2012. ^ "HUGO BOSS AG Organisational Structure". Hugo Boss AG. Archived from the original on March 23, 2011. Retrieved February 13, 2011. ^ Binnberg, Nils (April 11, 2017). "Techno tailor: Boss is revolutionising the made-to-measure suit". Wallpaper.com. ^ "PG.com HUGO BOSS: fragrances, contemporary design, design competition". Retrieved February 13, 2011. ^ "Movado Group Inc". Retrieved February 13, 2011. ^ "Safilo Group S.p.A/". Archived from the original on July 15, 2011. Retrieved February 13, 2011.